The Communist International published a theoretical magazine in a variety of European languages from 1919 to 1943. The Comintern ("Communist International", also known as the Third International) was an international Communist organization founded in Moscow in March 1919. The International intended to fight "by all available means, including armed force, for the overthrow of the international bourgeoisie and for the creation of an international Soviet republic as a transition stage to the complete abolition of the State." The Comintern was founded after the dissolution of the Second International in 1916, following the 1915 Zimmerwald Conference in which Vladimir Lenin had led the "Zimmerwald Left" against those who supported the "national union" governments in war with each other. The Comintern held seven World Congresses between 1919 and 1935. It also held 13 "Enlarged Plenums" of its governing Executive Committee, which had much the same function as the somewhat larger and more grandiose Congresses. These gatherings gradually assumed the role of ceremonial rituals rather than serving any decision-making function and were discontinued. The Comintern was subsequently officially dissolved in 1943. While the fissures had been evident for decades, World War I was to prove to be the issue which finally and irrevocably separated the revolutionary and reformist wings of the workers movement. The socialist movement had been historically antimilitarist and internationalist, and was therefore opposed to being used as "cannon fodder" for the "bourgeois" governments at war. This especially since the Triple Alliance gathered two empires, while the Triple Entente itself gathered the French Third Republic and the United Kingdom of Great Britain and Ireland with the Russian Empire . The Communist Manifesto had stated that "the working class has no country", and exclaimed "Proletarians of all countries, unite!" Massive majorities voted in favor of resolutions for the Second International to call upon the international working class to resist war should it be declared. Despite this, within hours of the declaration of war, almost all the socialist parties of the combatant states had announced their support for their own countries. The only exceptions were the socialist parties of the Balkans, Russia and tiny minorities in other countries. To Lenin's surprise, even the German SPD voted the war credits. Finally, the assassination of French socialist Jean Jaurès on July 31, 1914, killed the last hope of peace, by removing one of the few leaders who possessed enough influence on the international socialist movement to block it from aligning itself on national policies and supporting National Union governments. Socialist parties of neutral countries for the most part continued to argue for neutrality, and against total opposition to the war. On the other hand, Lenin organized the "Zimmerwald Left" opposed to the "imperialist war" during the 1915 Zimmerwald Conference, and published the pamphlet Socialism and War, in which he called all socialists who collaborated with their national governments "Social-Chauvinists" (socialist in their words but chauvinist in their deeds). The International was being divided between a revolutionary left, a reformist right and a centre wavering between each pole. Lenin also condemned much of the centre, which often opposed the war but refused to break party discipline and therefore voted war credits, as social-pacifists. This latter term was aimed in particular at Ramsay MacDonald (leader of the Independent Labour Party in Britain ) who did in fact oppose the war on grounds of pacifism but had not actively resisted it. Discredited by its passivity towards world events, the Second International was henceforth dissolved in the middle of the war, in 1916. In 1917, Lenin published the April Theses, which openly supported a "revolutionary defeatism": the Bolsheviks pronounced themselves in favour of the defeat of Russia in the war which would permit them to pass to the stage of a revolutionary insurrection. The victory of the Russian Communist Party in the Bolshevik Revolution of November 1917 truly shook the world. An alternative path to power to parliamentary politics was demonstrated in broad stokes. With much of Europe on the verge of economic and political collapse in the aftermath of the carnage of the Great War, revolutionary sentiments bubbled forth from a hundred hidden streams. The Russian Bolsheviks, headed by V.I. Lenin, firmly believed that unless socialist revolution swept Europe that they would be crushed by the military might of world capitalism, just as the Paris Commune had been crushed by force of arms in 1871. To this end, the organization of a new international to foment revolution in Europe and around the world became to the Bolsheviks an iron necessity. The Comintern was thus founded in these conditions at a congress March 2-6,1919, against the backdrop of the Russian Civil War. There were 52 delegates present from 34 parties. They decided that an Executive Committee would be formed with representatives of the most important sections, and that other parties joining the International would get their own representatives. The Congress decided that the Executive Committee would elect a five-member bureau to run the daily affairs of the International. However, such a bureau was not constituted and Lenin, Trotsky and Christian Rakovsky later delegated the task of managing the International to Grigory Zinoviev as the Chairman of the Executive. Zinoviev was assisted by Angelica Balbanoff, acting as the secretary of the International, Victor L. Kibaltchitch and Vladmir Ossipovich Mazin. Material was presented by Lenin, Trotsky and Alexandra Kollontai. The main topic of discussion was the difference between "bourgeois democracy" and the "dictatorship of the proletariat". Of these, the following attended: the Communist Parties of Russia, Germany, German Austria, Hungary, Poland, Finland, Ukraine, Latvia, Lithuania, Byelorussia, Estonia, Armenia, the Volga German region; the Swedish Social Democratic Left Party (the Opposition), Balkan Revolutionary People's of Russia; Zimmerwald Left Wing of France; the Czech, Bulgarian, Yugoslav, British, French and Swiss Communist Groups; the Dutch Social-Democratic Group; Socialist Propaganda League and the Socialist Labor Party of America; Socialist Workers' Party of China; Korean Workers' Union, Turkestan, Turkish, Georgian, Azerbaijanian and Persian Sections of the Central Bureau of the Eastern People's, and the Zimmerwald Commission. The first Chairman of the Comintern's Executive Committee was Grigory Zinoviev, from 1919 to 1926, but its dominant figure until his death in January 1924 was Lenin, whose strategy for revolution had been laid out in What Is to Be Done? (1902). The central policy of the Comintern under Lenin's leadership was that Communist parties should be established across the world to aid the international proletarian revolution. The parties also shared his principle of democratic centralism, "freedom of discussion, unity of action", i.e. that parties would make decisions democratically, but uphold in a disciplined fashion whatever decision was made. In this period, the Comintern was promoted as the "General Staff of the World Revolution". Ahead of the Second Congress of the Communist International, held in July-August 1920, Lenin sent out a number of documents, including his Twenty-one Conditions to all socialist parties. The Congress adopted the 21 conditions as prerequisites for any group wanting to become affiliated to the International. The 21 Conditions called for the demarcation between Communist parties and other socialist groups, and instructed the Comintern sections not to trust the legality of the bourgeois states. They also called for the build-up of party organisations along democratic centralist lines, in which the party press and parliamentary factions would be under the direct control of the party leadership. Regarding the political situation in the colonized world, the second congress of the Communist International stipulated that a united front should be formed between the proletariat, peasantry and national bourgeosie in the colonial countries. Amongst the twenty-one conditions drafted by Lenin ahead of the congress was the 11th thesis which stipulated that all communist parties must support the bourgeois-democratic liberation movements in the colonies. Notably some of the delegates opposed the idea of alliance with the bourgeoisie, and preferred giving support to communist movements in these countries instead. Their criticism was shared by the Indian revolutionary M.N. Roy, who attended as a delegate of the Communist Party of Mexico. The congress removed the term ‘bourgeois-democratic' in what became the 8th condition. Many European socialist parties went through splits on the basis of the adhesion or not to the new International. The French Section of the Workers International (SFIO) thus broke away with the 1920 Tours Congress, leading to the creation of the new French Communist Party (initially called "French Section of the Communist International" - SFIC); the Communist Party of Spain was created in 1920, the Communist Party of Italy was created in 1921, the Belgian Communist Party in September 1921, etc. Writings from the Third Congress, held in June-July 1921, talked about how the struggle could be transformed into "civil war" when the circumstances were favorable and "openly revolutionary uprisings". The Fourth Congress, November 1922, at which Leon Trotsky played a prominent role, continued in this vein. During this early period, known as the "First Period" in Comintern history, with the Bolshevik revolution under attack in the Russian Civil War and a wave of revolutions across Europe, the Comintern's priority was exporting the October Revolution. Some Communist Parties had secret military wings. On example is the M-Apparat of the Communist Party of Germany. Its purpose was to prepare for the civil war the Communists believed was impending in Germany, and to liquidate opponents and informers who might have infiltrated the party. There was also a paramilitary organization, the Rotfrontkämpferbund. The Comintern was involved in the revolutions across Europe in this period, starting with the Hungarian Soviet Republic in 1919. Several hundred agitators and financial aid were sent from the Soviet Union and Lenin was in regular contact with its leader, Bela Kun. Soon an official "Terror Group of the Revolutionary Council of the Government" was formed, unofficially known as "Lenin Boys". The next attempt was the "March Action" in Germany in 1921, including an attempt to dynamite the express train from Halle to Leipzig. When this failed Lenin ordered the removal of the leader of the Communist Party of Germany, Paul Levi, from power. A new attempt was made at the time of the Ruhr Crisis in spring and then again in selected parts of Germany in the autumn of 1923. The Red Army was mobilized, ready to come to the aid of the planned insurrection. Resolute action by the German government cancelled the plans, except due to miscommunication in Hamburg, where 200-300 Communists attacked police stations but were quickly defeated. In 1924 there was a failed coup in Estonia by the Estonian Communist Party. In 1924, the Mongolian People's Revolutionary Party joined Comintern. In China at first both the Chinese Communist Party and the Kuomintang were supported. After the definite break with Chiang Kai-shek in 1927, Stalin sent personal emissaries to help organize revolts which at this time failed. Lenin died in 1924. 1925 signalled a shift from the immediate activity of world revolution towards a defence of the Soviet state. In that year, Joseph Stalin upheld the thesis of "socialism in one country", detailed by Nikolai Bukharin in his brochure Can We Build Socialism in One Country in the Absence of the Victory of the West-European Proletariat? (April 1925). The position was finalized as the state policy after Stalin's January 1926 article On the Issues of Leninism. The perspective of a world revolution was dismissed after the failures of the Spartacist uprising in Germany and of the Hungarian Soviet Republic, and the reflux of all revolutionary movements in Europe, such as in Italy, where the fascist squadristi broke the strikes and quickly assumed power following the 1922 March on Rome). This period, up to 1928, was known as the "Second Period", mirroring the shift in the USSR from war communism to the New Economic Policy. At the 5th World Congress of the Comintern in July 1924, Zinoviev condemned Marxist philosopher Georg Lukács's History and Class Consciousness, published in 1923 after his involvement in Béla Kun's Hungarian Soviet Republic, and Karl Korsch's Marxism and Philosophy. Zinoviev himself was dismissed in 1926 after falling out of favor with Stalin, who already held considerable power by this time. Bukharin then led the Comintern for two years, until 1928 when he too fell out with Stalin. Bulgarian Communist leader Georgi Dimitrov headed the Comintern in 1934 and presided until its dissolution. In 1928, the 9th Plenum of the Executive Committee began the so-called "Third Period", which was to last until 1935. The Comintern proclaimed that the capitalist system was entering the period of final collapse, and that as such, the correct stance for all Communist parties was that of a highly aggressive, militant, ultra-left line. In particular, the Comintern described all moderate left-wing parties as "social fascists", and urged the Communists devote their energies to the destruction of the moderate left. With the rise of the Nazi movement in Germany after 1930, this stance became somewhat controversial with many such as the Polish Communist historian Isaac Deutscher criticizing the tactics of the Communist Party of Germany of treating the Social Democratic Party of Germany as the principal enemy. The 6th World Congress also revised the policy of united front in the colonial world. In 1927 the Kuomintang had turned on the Chinese communists, which led to a review of the policy on forming alliances with the national bourgeoisie in the colonial countries. The congress did however make a differentiation between the character of the Chinese Kuomintang on one hand and the Indian Swarajist Party and the Egyptian Wafd Party on the other, considering the latter as an unreliable ally but not a direct enemy. The congress called on the Indian communists to utilize the contradictions between the national bourgeosie and the British imperialists. The seventh and last congress of the Comintern was held between July 25 and August 20 1935. It was attended by representatives of 65 communist parties. The main report was delivered by Dimitrov, other reports were delivered by Palmiro Togliatti, Wilhelm Pieck and Dmitry Manuilsky. The congress officially endorsed the Popular Front against fascism. This policy argued that Communist Parties should seek to form a Popular Front with all parties that opposed fascism and not limit themselves to forming a United Front with those parties based in the working class. There was no significant opposition to this policy within any of the national sections of the Comintern; in France and Spain in particular, it would have momentous consequences with Léon Blum's 1936 election, which led to the Popular Front government. Stalin's purges of the 1930s affected Comintern activists living in both the USSR and overseas. At Stalin's direction, the Comintern was thoroughly infused with Soviet secret police and foreign intelligence operatives and informers working under Comintern guise. 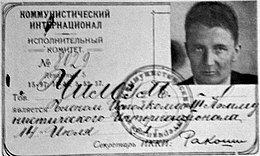 One of its leaders, Mikhail Trilisser, using the pseudonym 'Mikhail Aleksandrovich Moskvin', was in fact chief of the foreign department of the Soviet OGPU (later, the NKVD). At Stalin's orders, 133 out of 492 Comintern staff members became victims of the Great Purge. Several hundred German Communists and antifascists who had either fled from Nazi Germany or were convinced to relocate in the Soviet Union were liquidated, and more than a thousand were handed over to Germany. Fritz Platten died in a labor camp; the leaders of the Indian (Virendranath Chattopadhyaya or Chatto), Korean, Mexican, Iranian and Turkish Communist parties were executed. Out of 11 Mongolian Communist Party leaders, only Khorloogiin Choibalsan survived. A great number of German Communists were handed over to Adolf Hitler. Leopold Trepper recalled these days: "In house, where the party activists of all the countries were living, no-one slept until 3 o'clock in the morning.... Exactly 3 o'clock the car lights began to be seen.... we stayed near the window and waited [to find out], where the car stopped." At the start of World War II, the Comintern supported a policy of non-intervention, arguing that the war was an imperialist war between various national ruling classes, much like World War I had been (see Ribbentrop-Molotov Pact). But when the Soviet Union itself was invaded on 22 June 1941, the Comintern changed its position to one of active support for the Allies. But long before the war it became increasingly clear that, to the extent that the internal as well as the international situation of individual countries became more complicated, the solution of the problems of the labor movement of each individual country through the medium of some international centre would meet with insuperable obstacles." "To dissolve the Communist International as a guiding centre of the international labor movement, releasing sections of the Communist International from the obligations ensuing from the constitution and decisions of the Congresses of the Communist International." After endorsements of the declaration were received from the member sections, the International was dissolved. Messages between Tito and Dimitrov the Secretary-General in Moscow were intercepted and decrypted by the British GC&CS (Bletchley Park ) from 1943, though the volume of messages was not great (the first message from "Walter" (Tito) was intercepted on 21 April, though not decrypted until many months later). They showed the level of control exercised over him (Tito) by Moscow and continued with Dimitrov after June 1943, when the Comintern itself was dissolved. Usually, it is asserted that the dissolution came about as Stalin wished to calm his World War II Allies (particularly Franklin D. Roosevelt and Winston Churchill) and keep them from suspecting the Soviet Union of pursuing a policy of trying to foment revolution in other countries. The International Department of the Central Committee of the Communist Party of the Soviet Union was founded at roughly the same time that the Comintern was abolished in 1943, although its specific duties during the first several years of its existence are unknown. In September 1947, following the June 1947 Paris Conference on Marshall Aid, Stalin gathered a grouping of key European communist parties and set up the Cominform, or Communist Information Bureau, often seen as a substitute to the Comintern. It was a network made up of the Communist parties of Bulgaria , Czechoslovakia , France , Hungary , Italy , Poland , Romania , the Soviet Union, and Yugoslavia (led by Josip Broz Tito, it was expelled in June 1948). The Cominform was dissolved in 1956, following Stalin's 1953 death and the XXth Congress of the CPSU. While the Communist parties of the world no longer had a formal international organization, they continued to maintain close relations with each other through a series of international forums. In the period directly after dissolution of Comintern, periodical meetings of Communist parties were held in Moscow . Moreover World Marxist Review, a joint periodical of the Communist parties, played an important role in coordinating the communist movement up to the break-up of the Socialist Bloc in 1989-1991. The complicated relationship between the Comintern and the Communist Party of China (CPC) is an important chapter in the history of Comintern. The CPC was established in 1921 with the help of Comintern. The CPC declared itself as a branch of the Comintern. At that time, China had a big revolutionary party called The National Party of China (Kuomintang). Its leader, Dr. Sun Yatsen, frustrated by the refusal of help from western countries, quickly turned to the Soviet Union and Comintern. Under the instruction of the Comintern, the CPC joined the Kuomintang. Kuomintang applied for membership in Comintern, but was not accepted. However, the Comintern viewed Kuomintang as a quasi-Communist Party. Sun Yatsen’s successor, Chiang Kai-shek, was once elected as an honorary member of the standing committee in Comintern. After the success of the joint revolution of the Kuomintang and CPC, they split. The Kuomintang under Chiang Kai-shek turned into an anti-communist force. The Comintern instructed the Communists to initiate urban riots, but all failed. A group of “native Communists”, such as Mao Zedong, used peasant riots to establish the Soviet Republic of China in remote mountain villages. The Comintern sent a German, Otto Braun, as the military adviser, who became the real highest commander later. Zhou Enlai, once the Comintern's favorite, was the chairman of the military committee of CPC. After being besieged by Chiang Kai-shek’s army, the Chinese Red Army had to escape to try to find a new base - this came to be known as the Long March (1934-1935). During the Long March, the party leadership re-examined its policy in Zunyi (January 1935). Mao Zedong blamed their failure on blindly following the Comintern's instructions. During the heated debate, Zhou Enlai unexpectedly accepted the criticism and sided with Mao. Otto Braun was dismissed from his commanding position. After they resettled in Yanan, the native Communists, such as Mao and Zhu De, gained power. Those who were loyal to the Comintern, such as a group called 28 Bolsheviks, fell from important positions. Zhou Enlai became an assistant to Mao in political affairs, such as United Front and diplomacy. The Comintern and Soviet Union could no longer control the CPC. The Comintern continued to give advice, but much was ignored. An exception was the Northeast Anti-Japanese United Army, organized by the Manchuria branch of the CPC in 1932. Geographically separated from the CPC headquarters in Yenan, this guerrilla army did not report directly to the CPC center, but was still led and supported by the Soviet Union under the name of Comintern until it was defeated by Japanese occupation force and fled to the Soviet Union in 1942. Berg, Nils J. I kamp för Socialismen - Kortfattad framställning av det svenska kommunistiska partiets historia 1917-1981. It opened with a tribute to Karl Liebknecht and Rosa Luxemburg who had recently been murdered by the Freikorps during the Spartakus Uprising. Stockholm: Arbetarkultur, 1982. p. 19. Kibaltchitch would later take the name 'Victor Serge'. A former anarchist, he was not even a member of the RCP(b) at the time. In his own words, he considered that it was his knowledge of various European languages that motived his inclusion into the Comintern apparatus. See: Serge, Victor. Memoirs of a Revolutionary. Lenin, V. (1906), Report on the Unity Congress of the R.S.D.L.P. William Henry Chamberlin Soviet Russia: A Living Record and a History 1929, chapter 11; Max Shachtman "For the Fourth International!" New International, Vol.1 No.1, July 1934; Walter Kendall "Lenin and the Myth of World Revolution", Revolutionary History). For example, the thirteenth condition stated that "The communist parties of those countries in which the communists can carry out their work legally must from time to time undertake purges (re-registration) of the membership of their party organisations in order to cleanse the party systematically of the petty-bourgeois elements within it. The term "purge" has taken on very negative connotations, because of the Great Purge of the 1930s. In the early 1920s, however, the term was more ambiguous. See J. Arch Getty Origins of the Great Purges: The Soviet Communist Party Reconsidered, 1933-1938 p.41 for discussion of the ambiguities in the term, including its use in the 1920 Comintern resolution. The Black Book of Communism p. 298-301.